Jackal (特殊部隊ジャッカル, Tokushu Butai Jakkaru?, lit. Special Forces Jackal), released in North American arcades Top Gunner, is an overhead run and gun game released by Konami in 1986. In Japan, a Family Computer Disk System version was produced titled Final Command: Akai Yōsai (ファイナルコマンド　赤い要塞, Final Command: Akai Yōsai? Final Command: The Red Fortress), which was released in 1988. A cartridge conversion for the NES was released under the Jackal title on September 1988 in North America. The Jackal squad, a four-man team composed of Colonel Decker, Lieutenant Bob, Sergeant Quint and Corporal Grey, is sent to rescue soldiers kept as hostages by the enemy. One or two players control the teams in an armed jeep, which must venture through several enemy strongholds to rescue comrades imprisoned by the enemy. The goal is to rescue prisoners of war from various buildings and then transfer them to helicopter dust-off locations. Extra lives are granted when certain scores are attained. If a collision occurs with an enemy vehicle or the jeep is hit by an enemy bullet, a life will be lost. Some buildings contain one flashing prisoner; if this man is rescued, the jeep's primary weapon will be upgraded. In addition, if enough prisoners are rescued, a weapon upgrade will be yielded during the unloading process to the rescue helicopter. The Jeep's initial weapons consist of a machine gun and a grenade launcher. The grenade launcher can be upgraded into a rocket launcher, which can be further upgraded to shoot long-range missiles, and two kinds of spread missiles. There were three versions of the original coin-operated game. The original Japanese version (Tokushu Butai Jackal), the world version (simply titled Jackal), and the North American version (Top Gunner). 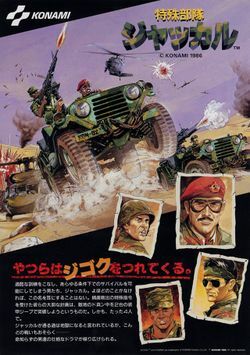 In the Japanese version, the machine gun shoots in whatever direction the player's jeep is facing, whereas in the worldwide and North American versions, it is fixed so that it always shoots north. However, the hardware can be modified to accept the kind of rotary controller seen on Ikari Warriors cabinets, which would permit the player to manually adjust the direction of the jeep's machine gun. In the North American versions, the generic orange and blue flags on the players' jeeps are replaced by an American flag on each one. In the home conversions to Nintendo systems, the long continuous map is broken up into six stages. Once the soldiers are secure, the player(s) must then proceed to defeat a boss at the end of each level. In the last level, there are two bosses that must be defeated. The NES version has a number of changes made when compared to the Disk System version released in Japan. While the FDS version's levels were the width of a single screen, the NES version contained wider levels, a new boss, and a map shown before each level indicating the player's progress. The NES version of Jackal was included as a bonus game in the PC compilation Konami Collector's Series: Castlevania & Contra released in 2002 in North America. Computer ports of Jackal were published by Konami in 1989 in North America for IBM PC and the Commodore 64. European developer Imagine Software created a different Commodore 64 version of Jackal, along with versions for the ZX Spectrum and Amstrad CPC in 1988. In 2009, Konami released a mobile phone version of the game in Japan based on the NES version. Another mobile version was released by Konami in China for normal Java cellphones in 2010. This page was last edited on 26 March 2017, at 09:03.